Mobile Customer Relationship Management (CRM) and cloud consulting services provide entire CRM features and experience on a smartphone, tablets, and other internet-enabled devices. Mobile CRM assists sales, marketing, and customer service teams to access and manage the database in real time, whenever and wherever they are. Smartphones are no longer luxury; they are a necessity. But does it impact the bottom line? Will it boost all your sales value, accelerate your cash flow, shorten the sales, increase the team’s productivity, and improve the workflow insight? Let’s find out. Why organizations need cloud-based CRM solutions? The mass migration of internet users from desktop to mobile devices implies that people expect real-time information to be accessible from anywhere. According to specific stats, the number of global internet traffic coming from mobile devices elevated from 0.7% in 2009 to 52.99% in 2017, and the numbers continue to grow. This is because a mobile CRM development services allow users to access their data no matter where they are, allowing them to run their business on the go. Mobile CRM software and Internet-enabled devices can deliver all the classic functionality of a system hosted on a desktop or laptop, but additionally adding the benefit of on-the-go access through cloud-based CRM solutions. Mobile CRM software services, such as Salesforce CRM consulting services or Zoho CRM consultation, allow remote workers access to their data when they are away from their desk. Sales reps travel between offices and location to meet with their prospects. Field agents need access to schedule and work, even when not in the office. Now with remote access, they are proving to be more productive. Research studies have shown that companies gain an extra 240 Hours of work annually with mobile devices. All this because smartphones allow users the freedom to work from wherever suits them. And even if they aren’t in the same building, state, or country, the entire organization gets access to the same data. And that too irrespective of the compatibility issues, providing a more collaborative work environment. Customers also benefit from a cloud-based CRM solution because of the availability of the organization. A mobile CRM, whether it is Salesforce or the Zoho CRM solutions, can help you ensure that your customers are getting the best services available 24/7. Employees have access to the data at real-time. This makes them fully-equipped to offer their clients with reliable information that they need, without wasting any time. Even employees who are not working with the clients directly use mobile CRM to manage schedules, generate reports, make data analysis, and organize files all in one secure location. Companies who have switched to Mobile CRM development services are more likely to close more sales than the ones who haven’t made the change yet. The figures state that 65% of sales reps using mobile CRM than the 22% who haven’t accessed this technology. Mobile CRM strategy provides sales reps with better access to customer information. The lesser time sales reps require in searching for the information they need, the more time they can spend interacting with the customers and nurturing the existing relationships. Thus, these cloud-based CRM solutions help you acquire new customers and more profits. Employees working away from their office premises often require more information about their clients that just name and contact number. Mobile CRM solutions allow data stored in the customer’s account including details about the previous interaction done with the company. They can also make use of the mobile CRM system to add additional information. This will allow other employees back at the premises to see the added information. All the above benefits of mobile CRM strategy when combined create a significant boost in the overall productivity. When a sales rep can quickly access the latest database of their clients, then they can directly deliver a service that can meet the customer’s needs. With the help of efficient search technologies, there is lesser time taken searching for the information they require. And thus, employees can accomplish more during working hours, leading to the overall enhancement in productivity. Increased Sales Mobile CRM Strategy shows 26.4% of increased sales productivity by adding social and mobile access abilities to CRM. Cash Flow 9.9% of the cash flow increases when invoices go out three days sooner. Improved Insights 88% of the executives say smartphones are most important for their company’s success. As a result of all these benefits, companies can yield more precious, more insightful, and positive relationship with their clients and prospects. Employees can also review the previous conversation, respond to the queries, and react to the client’s preferences in real-time. 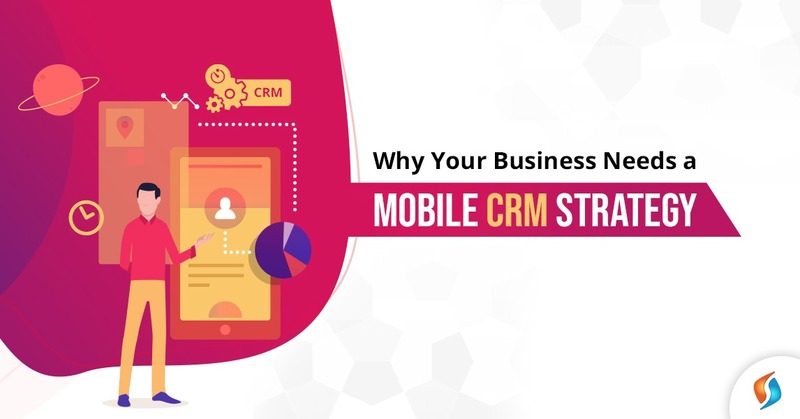 Not only mobile CRM and cloud service providers in India offer valuable insights of the clients, but it also plays a vital factor in advancing the business goals and targets, hence bringing in more value to the business. Get the best cloud-based CRM solutions! Are you thinking of implementing Mobile CRM strategy to your company’s process? Talk to our consultants and know about our ZOHO CRM and salesforce services, and put a mobile CRM strategy to use in your business and bridge the gap in your team’s efficiency. Signity solutions is one of the leading custom website development company in India with years of experience in CRM development services. Our team has been helping clients from all around the world with their CRM software requirements. We would love to partner with you in taking your business to new heights with our cloud CRM solutions. Get in touch with our IT outsourcing services team now!